Blog » What does it take to record the world’s birds? Photographer and sound recordist Gerrit Vyn traveled to a remote Brazilian hillside to document the critically endangered Araripe Manakin. Photo by Gerrit Vyn. What does it take to record the world’s birds? BirdNote and Cornell Lab of Ornithology producer and photographer Gerrit Vyn take you deep into the Brazilian forest in search of the critically endangered Araripe Manakin — and deep inside the Lab’s archive. Every day, BirdNote brings you the sounds of birds from all over the United States — and the world. But this is public radio, so we aren’t just grabbing an old sound-effects CD off the shelf… every cheep, chip and honk came from a person: an audio engineer, who mounted a scientific expedition to a far-flung corner of the world in order to capture that unique, natural sound. Today on BirdNote, we’re exploring the art, and the adventure, of capturing bird song. The Cornell Lab of Ornithology has been sending specialized audio engineers and photographers out into the world for nearly a hundred years. In 1929, Lab founder Arthur Allen was the first person ever to record wild birdsong. Allen recorded the birds for the Fox Movietone newsreel company. In 1935, Allen, Kellogg, and several others set off across the country in a truck full of enormous recording gear, including a modified Movietone. On the trip, Allen captured what remain the only film and sound recordings of the Ivory-billed Woodpecker. Today, Cornell scientists and sound engineers can be found everywhere. There are teams in Central Africa. And even people diving under water to record whale song. 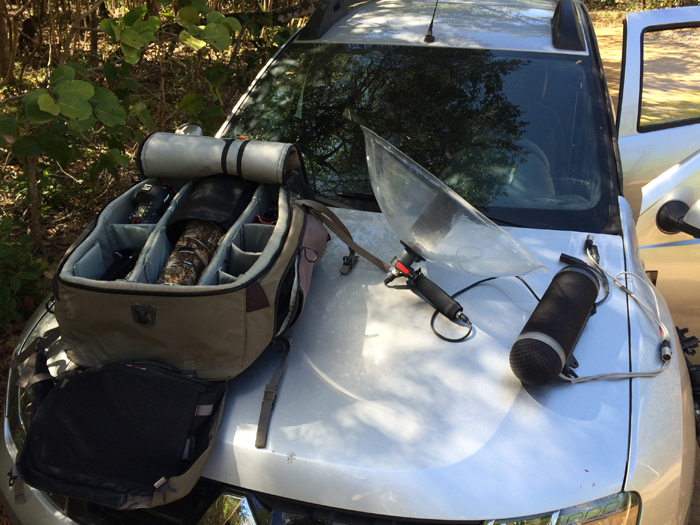 Field expeditions require a lot of gear. Cornell Lab of Ornithology producer Gerrit Vyn had to pack cameras, lenses, microphones, food and pounds of documentary and hiking gear on his back in order to record the Araripe Manakin in Brazil. Photo by Gerrit Vyn. Gerrit Vyn is a producer and a photographer for the Lab. Gerrit travels all over the world, recording the sounds of critically endangered birds. 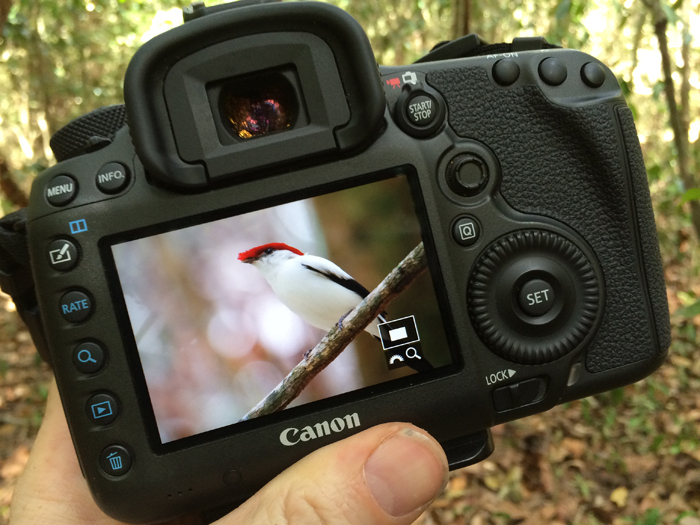 On this trip, he’s traveled to Crato, Brazil to capture sights and sounds of the endangered Araripe Manakin. It’s getting harder and harder to capture pristine sounds of the natural world, but on a quiet day — like, say, Christmas morning — there are a lot fewer people out making noise. "It’s incredible if you just sit somewhere quietly and listen, even if you’re way out in the forest somewhere, all of the human noises you can still hear in the distance. And all of those are amplified when you’re audio recording," Gerrit says. "So most of the Araripe Manakins occur on the slopes of the Araripe Plateau, and along these slopes it’s pretty heavily populated. Almost all the recordings that exist of this species have dogs or roosters in the background, or music, or cars or whatever." But Gerrit found one quiet place on the map. A place far enough off the beaten path. Or so he hopes. “The combination of it being Christmas, which seems to be a pretty quiet day, not a lot of people out yet, and the secluded nature of this one spot, which I've never been to before — I'm hoping I can get some beautiful recordings of this bird up there,” he says. The Araripe Manakin is about the size of a large sparrow. It's white with a blood-red hood, black wing-tips, and black tail-feathers. It is also one of the most endangered birds in the world. They live on just a few hillsides along the Araripe Plateau in northeastern Brazil. “Literally, I can see the entire species’ range from a hilltop here,” Gerrit says. Gerrit hiked this seasonal ravine to find the manakins. 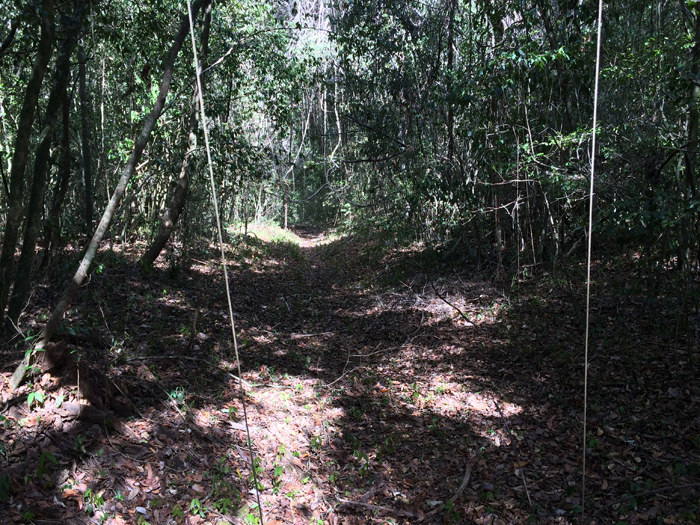 The dry creek bed made for a nice trail, and passed through the singing territories of several male manakins. Photo by Gerrit Vyn. Gerrit is a portable recording studio. He’s carrying pounds of microphones and cameras and lenses on his back… plus food and hiking gear for hours of walking alone through the forest. "All right, so I'm getting my gear together, to head off on this trail. Pack a bag full of camera gear. And have a parabolic microphone and then a stereo microphone set up for recording." "The cicadas are really going already. It's going to be hot," Gerrit says. "Alright I got my food, a couple bananas, a couple Cliff Bar-ish things. Oh now, I just realized something else I forgot. I don’t have water. Well I definitely forgot my water jug. All right, so I'm going to be sweating and it's going to be very hot. And I'm going to be very thirsty. And suffering. What else is new?" "All right. I got my parabola. So… I got my snake gaiters on. Alright, so here we go, off into the forest." After a short hike, Gerrit finds a promising spot to record the manakins. We’re on a forested hillside in Brazil with Gerrit Vyn of the Cornell Lab of Ornithology. Play the sound file at the top of this page, and maybe, if we close our eyes, we can be there with him for just a few quiet moments. Today, the Macaulay Library hosts one of the largest collections of natural sounds anywhere in the world. Thanks to Gerrit Vyn for taking us along with him on his trip to Brazil. And to the Cornell Lab of Ornithology for these and so many other sounds of the natural world. BirdNote is a small, independent public media program based in Seattle, but with partners across the country and the world. Learn more about our team, and how you can help birds, at BirdNote.org. BirdNote’s technical director and producer is John Kessler. Ellen Blackstone is our associate producer. We had editing help from Catherine Stifter and Dominic Black. Our team also includes Bob Sundstrom, Dennis Paulson, Gordon Orians, Katie Meyer, Sandra Brierley, Jenn Dean, Michael Stein, Kate Godman and Liza Gonzales-Ramos. Our managing producer is Jason Saul. And our executive director is Sallie Bodie. Subscribe to BirdNote on iTunes, or find us on SoundCloud. Or tune in to our radio show, airing daily on over 230 public radio stations nationwide. Longer stories are a new thing for BirdNote — tell us what you think on our website, or on Twitter or Facebook. This podcast is made possible by the Bobolink Foundation and The Hugh and Jane Ferguson Foundation.